This is an 8x 12 chocolate cake with marshmallow vanilla icing coating. It is bordered using a star tip . 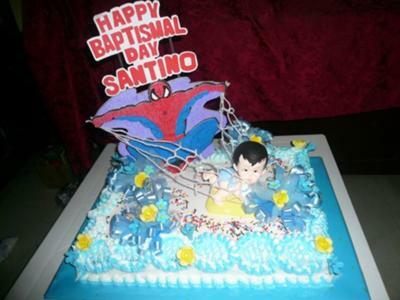 Styro Spiderman was used as an accent to the cake holding an improvised web yarn. I put flowers on it. The very important part is the baby decor for it to find it out that this cake is for baby's baptismal day.